Photograph of Sgt. 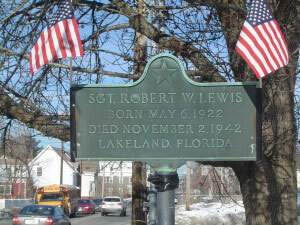 Robert W. Lewis recognition plaque, located in Manchester NH at the corner of Massabesic Street and Mammoth Road. Copyright of Martin Miccio for the City of Manchester, and used here with permission. He was the older son of Walter F. & Mary L. (Rowell) Lewis, born 6 May 1922 in Manchester, Hillsborough County, New Hampshire. He grew up in the vicinity of 1166 Hayward Street, attending the local Manchester schools. His military enlistment papers state that he had four years of high school, stood just over 6 feet (73 inches) tall, and weighed 164 pounds. Newspaper article–Wednesday, November 4, 1942; Springfield Republican (Springfield MA), page 4. He enlisted in the US Army Air Corps on 2 Jan 1942 and was assigned to 450 Bomb Squadron of the 322nd Bombardment Group which moved up from MacDill Field for 2d phase combat training at Lakeland Air Force Base in Florida, arriving in late September. 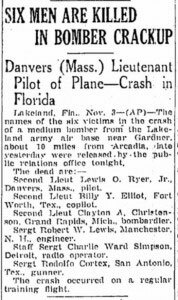 According to a 1942 newpaper article, “the names of the six victims in the crash of a medium bomber form the Lakeland army air base near Gardner, about 10 miles from Arcadia” included that of “Serg. Robert W. Lewis, Manchester N.H., engineer.” The article goes on to state that the crash occurred on a regular training flight. This above information is confirmed by both the Florida Death Index, placing the location of Robert W. Lewis’s death in Hardee County, Florida. He is buried in Pine Grove cemetery.